Want to win $500?!? 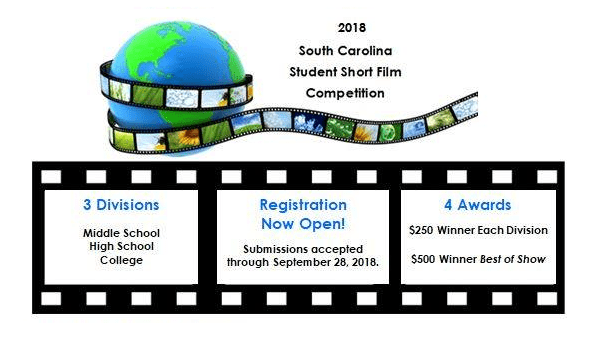 Enter your short film in the 2018 SC Student Short Film Competition open to all middle school, high school, and college students in South Carolina! We are thrilled to announce that the Anne Frank House Partnership at the University of South Carolina is now a sponsor of our competition. Create a film using the theme Lo Ta’amod, a concept defined as not standing by while others are threatened or mistreated with rudeness, bullying, violence, racism or intolerance. There will be a $250 winner in each division and a $500 Best of Show award. You can enter one film. Your film must be at least 3 minutes long, but no longer than 6 minutes. Your film must abide by PG-13 guidelines. Upload your film to either YouTube or Vimeo by September 28, 2018. Winning filmmakers will be notified by October 12, 2018. Presentations of awards and screening of the winning films will be held at The Nickelodeon on Sunday, October 21, 2018, at 3:00 pm. Email cjfilmfestival@gmail.com if you have any questions. I hope you will share this information with your aspiring young filmmakers when the new school year starts in August. Maybe you can incorporate it as an assessment in your curriculum for the 1st Nine Weeks, or pursue it as a homeschool project. What better way to start the year with a project on not standing by while others are threatened or mistreated with rudeness, bullying, violence, racism or intolerance.